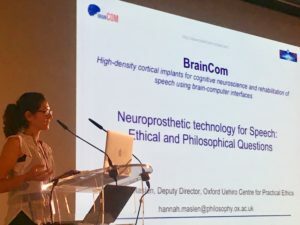 One of our Principal Investigators – Dr Hannah Maslen, who leads our work package on Ethics, Impacts and Society – presented the Consortium’s current research at the Neuroethics Network Annual Meeting, held at the Institut du Cerveau et de la Moelle Épinière (ICM), Hospital Pitié-Salpêtrière, Paris (19th-21st June, 2017). – how clinicians should approach patient consent and decision-making in cases where the expression of preferences and wishes is entirely mediated by a BCI. application. Dr Maslen is grateful for the comments and questions received.